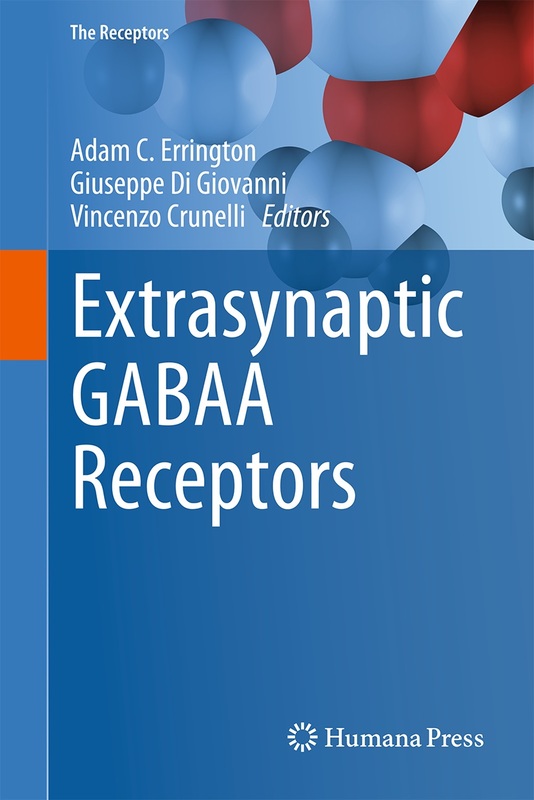 I am Editor-in-Chief of the new book ‘Extrasynaptic GABAA Receptors’ that is part of ‘The Receptors’ series published by Springer. This book is the first of its kind covering this fascinating subject and covers all aspects of the biophysics, pharmacology, physiology and pathophysiology of these critical GABA receptors. The book includes chapters from leading experts in the field of extrasynaptic GABAA receptors. Please click on the links below to read our work. Most articles are freely available without subscription. Please click on the links below to read our work. Most articles are freely available without subscription. 1) *NEW* Noakes Z, Keefe F, Tamburini C, Kelly CM, Santos MC, Dunnett SB, Errington AC, Li M (2019) Human pluripotent stem cell-derived striatal interneurons: differentiation and maturation in vitro and in the rat brain. Stem Cell Reports In Press doi: 10.1016/j.stemcr.2018.12.014. 2) Connelly WM, Crunelli V, Errington AC* (2017) Variable action potential backpropagation during tonic firing and low-threshold spike bursts in thalamocortical but not thalamic reticular nucleus neurons. Journal of Neuroscience 37(21): 5319-5333. doi: 10.1523/JNEUROSCI.0015-17.2017. 3) Connelly WM, Crunelli V, Errington AC* (2016) Passive synaptic normalization and input synchrony-dependent amplification of cortical feedback in thalamocortical neuron dendrites. Journal of Neuroscience 36(13): 3735-3754. doi: 10.1523/JNEUROSCI.3836-15.2016. 4) Connelly WM, Laing ML, Errington AC, Crunelli V (2016) The thalamus as a low pass filter: filtering at the cellular level does not equate with filtering at the network level. Frontiers in Neural Circuits 9(89). doi: 10.3389/fncir.2015.00089. 5) Connelly WM, Crunelli V, Errington AC* (2015) The global spike: conserved dendritic properties enable unique Ca2+ spike generation in low-threshold spiking neurons. Journal of Neuroscience 35(47): 15505-15522. doi: 10.1523/JNEUROSCI.2740-15.2015. see also – This Week In The Journal, Journal of Neuroscience 35(47):i. The low threshold spike occurs in neurons throughout the brain. In this study we reveal that in thalamocortical neurons and thalamic reticular nucleus neurons it is generated by a unique mechanism that involves recruitment of spatially distributed dendritic T-type Ca2+ channels. 6) Gould T, Chen L, Emri Z, Pirttimaki T, Errington AC, Crunelli V, Parri HR (2014) GABAB receptor mediated activation of astrocytes by gamma-hydroxybutyric acid. Philosophical Transactions of the Royal Society B 369 : 1654. doi: 10.1098/rstb.2013.0607. 7) Connelly WM, Errington AC, Crunelli V (2013) γ-hydroxybutyric acid is not an agonist of extrasynaptic GABAA receptors. PLoS One 8:11. doi: 10.1371/journal.pone.0079062. A previous study using recombinant α4βδ GABAa receptors expressed in Xenopus leavis oocytes suggested they are high affinity targets for γ-hydroxybutyric acid (GHB). In this study we found that GHB is not an agonist at native δ-subunit containing receptors in the dentate gyrus, striatum and thalamus suggesting the effects of GHB are not mediated by these receptors. 8) Yague JG, Cavacini A, Errington AC, Crunelli V, Di Giovanni G. (2013) Dopaminergic modulation of tonic but not phasic GABAA inhibition in the ventrobasal thalamus of Wistar and GAERS rats. Experimental Neurology 247: 1-7. doi: 10.1016/j.expneurol.2013.03.023. 9) Connelly WM, Fyson SJ, Errington AC, McCafferty C, Cope DW, Di Giovanni G, Crunelli V. (2013) GABAB receptors regulate extrasynaptic GABAA receptors. Journal of Neuroscience 33(9): 3780-3785. doi: 10.1523/JNEUROSCI.4989-12.2013. see also – This Week In The Journal, Journal of Neuroscience 33(9):i. This study demonstrated that metabotropic GABAb receptors directly postsynaptically modulate extrasynaptic GABAa receptors that mediate tonic GABAergic inhibition via a mechanism involving cAMP-dependent protein kinase (PKA). 10) Errington AC*, Hughes SW, Crunelli V (2012) Rhythmic dendritic Ca2+ oscillations in thalamocortical neurons during slow non-REM sleep-related activity in vitro. Journal of Physiology 590(16): 3691-3700. doi: 10.1113/jphysiol.2012.232132. In the visual thalamus, many retinal inputs form specialised tripartite synapses with dendrites of thalamocortical neurons and local interneurons known as triads. In this study we show that activation of mGluR receptors on interneuron dendrites enhances GABA release and increases tonic inhibition of thalamocortical neurons. 16) Errington AC*, Renger JJ, Uebele VN, Crunelli V. (2010) State-dependent firing determines intrinsic dendritic Ca2+ signaling in thalamocortical neurons. Journal of Neuroscience 30(44):14843-53. doi:10.1523/JNEUROSCI.2968-10.2010 see also – This Week In The Journal, Journal of Neuroscience 30(44):i-i. Low threshold spikes are a defining feature of thalamocortical neurons and allow them to fire in two separate behavioural state-dependent modes; tonic and burst firing. In this study we demonstrate that these different firing modes result in dendritic calcium signals that have distinct spatial and temporal properties and are mediated by different classes of calcium channel. Lacosamide (Vimpat) is an anticonvulsant used for the adjunctive treatment of partial-onset seizures and also in neuropathic pain. In this study we revealed the mechanism of action of the drug. This study revealed a new mechanism of action for anticonvulsant drugs, modulation of voltage gated sodium channel slow inactivation. 1) Crunelli V, Lorincz ML, Connelly WM, David F, Hughes SW, Lambert R, Leresche N, Errington AC* (2018) Dual function of thalamic low-vigilance state oscillations: rhythm-regulation and plasticity. Nature Reviews Neuroscience 19(2):107-118. doi: 10.1038/nrn.2017.151. 2) Connelly WM, Errington AC, Di Giovanni G, Crunelli V (2013) Metabotropic regulation of extrasynaptic GABAA receptors. Frontiers in Neural Circuits 7: 171. doi: 10.3389/fncir.2013.00171. 3) Connelly WM, Errington AC* (2012) Temporally selective firing of cortical and thalamic neurons during sleep and wakefulness. Journal of Neuroscience 32(22): 7514-7517. doi: 10.1523/JNEUROSCI.1164-12.2012.